I am a Graphic & Web Designer based in Belem - Brazil, specializing in User Interface Design and User Experience. I build clean, appealing, and functional interfaces which comply with the latest web standards. But that’s just a part of it. Design is my life. It’s my five-star spa. It’s my roller-coaster. It’s something I do before going to bed, and something I can’t wait to do in the mornings. Without it, my world would be black and white. "We love this designer! :)"
"I worked with Rodolfo for the first time and I will do it again! First-class work from start to finish. Creative AND hardworking like a bee. Thank you, Rodolfo!" "99Rodolfo was an absolute pleasure to work with. I've worked with many designers in the past and 99Rodolfo was by far the best designer i've ever worked with. His work is unique and high quality, he puts care into the project, and he has quick res..."
"Rodolfo is amazing to work with! He kept iterating and iterating until we he nailed exactly what we were looking for. He never once expressed frustration when I kept waffling on a design idea. The final designs look great and we're excited to build it o..."
"Awesome Work done again !" "Rodolfo has been extremely helpful with inputs and has lived up to the promise for a timely and apt delivery. Greatly recommended!!!" "Rodolfo did a great job on this request. It was a follow-up to another project, and he did it with the same enthusiasm and responsiveness, which we really appreciated it." "Working with Rodolfo was a really good experience. He understood well the briefing and was able to propose a satisfing design. He's really professionnal and available to make all the modifications needed. Highly recommanded." "Rodolfo provided 4 webpage templates, along with all the little web elements. Some of the pages were clearly defined, some were still a rough sketch. Rodolfo did 3 things with excellence: #1: He communicated regularly & clearly. This is invaluable whe..."
"Great designer. Good work together!" "I was blessed to find this designer, who is extremely resourceful, enthusiastic and motivated. 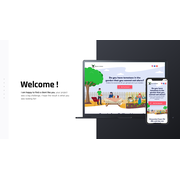 He is not just efficient in putting his IT skills and knowledge into your project, but he dives into your project turning over the net and researching your f..."
"Webdesign 2.0 has worked reliably and quickly. The design was by far the best of our contest." "Thank you Patricia for doing a very good job, responding quickly and doing exactly what we asked, in time. I would definitely recommend your services. " "Excellent work, very professional and helpful!" "Awesome designer, really impressed by his work."